Getting the temperature forecast is important at anytime throughout the year. However, when the temperatures start taking the sometimes-wild roller coaster ride that comes in spring, knowing how hot or cold it is becomes vital. So where do you go to get a good idea of what the temperature will be like in your neighborhood, city, state, or national region? 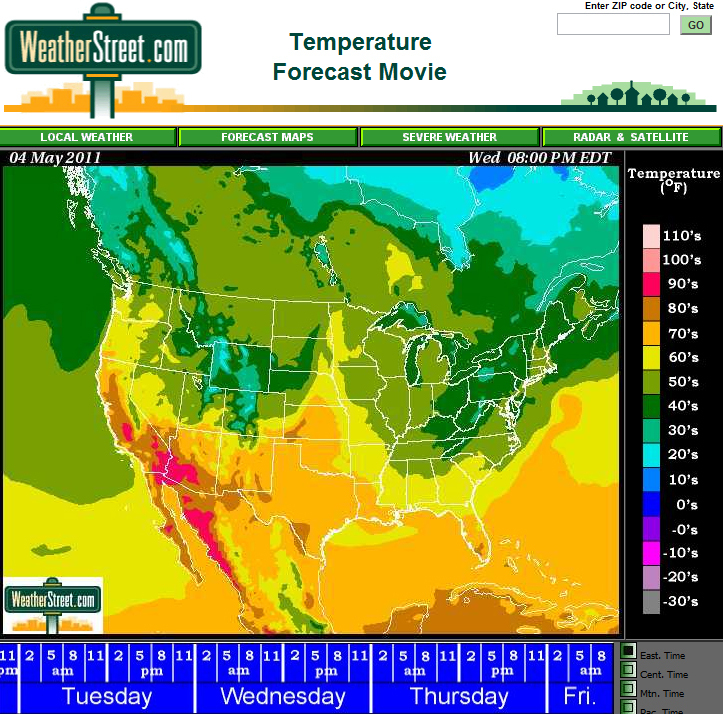 There are many great sites, but I like the temperature forecast movie at Weather Street. You can literally scroll through the upcoming days — and even times of the day — to see a color-keyed map of the nation telling you exactly what temperature range to expect. You want to see how cold it will be in the Northeast at 2 PM on Saturday? The temperature forecast movie shows you! You can even enter your zip code to get the specific forcast for that area. Give it a try — this is one neat weather tool.